While some couples prefer the unique look of an antique or vintage diamond engagement ring, contemporary engagement rings offer many options for individualized tastes without sacrificing classic styles or traditions. Simply put, these rings are modern-day designs. 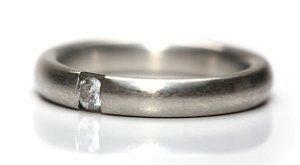 Some people assume any newly-crafted ring is contemporary, but that isn't necessarily accurate. A replica vintage ring, for example, is properly called vintage rather than contemporary. Similarly, classic, simple settings, such as diamond solitaire engagement rings, are more traditional than contemporary. However, traditional settings can be modernized with additional details and accents. Contemporary designs take full advantage of modern technology that allows new metal alloys, unique diamond shapes, and intricate details to be woven together to create rings that may have been impossible to fabricate in earlier decades. With many options available, the combinations are virtually limitless to create unique and stylish engagement rings. Modern rings have a wide range of designs. A couple's preferences can include the types of stones used, different varieties of metals, and other stylistic considerations that create a customized symbol of their commitment to one another. While diamonds remain the most popular stone choice, contemporary pieces may use recently perfected diamond alternatives. Moissanite and cubic zirconia are two increasingly popular choices because of their exceptionally high quality and general affordability when compared to high quality diamonds. Colored stones are also popular in modern designs, particularly rare gems, such as tanzanite.The number of stones also varies in contemporary engagement rings. Traditional rings have only one large stone, although it may be accented with a number of smaller gems. Three stone engagement rings with three larger stones are growing in popularity as well. Furthermore, stones may be used to accent the wedding band as well as the engagement ring, whereas older, more traditional styles use only plain bands. Gold, silver, and platinum are all traditional engagement ring choices. However, contemporary engagement rings often use combinations of different metals to create multi-toned designs, highlighting the metals as well as the gems. Mokume gane engagement rings combine different alloys into distinctive patterns, and Celtic engagement rings may use different metals to emphasize their intricate knot designs. Titanium rings are distinctively contemporary because the process to create titanium was only perfected in the past few decades, and the metal has only recently become widely used in jewelry. Jewelers are continually devising new ring settings to create more elegant and distinctive designs. These modern settings are popular in contemporary engagement rings because they cannot be found in older, more common pieces of jewelry. Pave setting engagement rings are one example, while partial settings such as the half-bezel are also exquisitely modern. Some jewelers even create truly invisible settings where the metal holding the stone is virtually non-apparent, making the gem appear suspended above the band. Contemporary rings have many design details that older rings simply could not incorporate because the technology did not exist for the delicate craftsmanship. While engraving has always been popular, modern engagement rings are able to have much more engraved inside the band because laser engravers can create smaller, finer lettering. Exterior engraving is also gaining popularity because of different fonts and patterns previously unheard of. Some master jewelers are even able to engrave sentiments on the diamond itself. Intricate metalwork is also a feature of contemporary design. Scrollwork that includes hearts, words, and symbols can be integrated into the setting's arch or along the band itself, adding texture and dimension to the ring without sacrificing the delicacy of the piece. No matter what contemporary design you choose, remember that trends and styles are continually evolving. What appears to be an ultra-modern, chic ring today may be simply an antique novelty tomorrow. That shift in style will make the ring even more unique and exclusive, and it will forever be an enduring symbol of your love that lasts far beyond trends, styles, and contemporary designs.